Comic Book Brain Splatter: REVIEW: Marvel's Agents of S.H.I.E.L.D. Episode 1.03, "The Asset"
REVIEW: Marvel's Agents of S.H.I.E.L.D. Episode 1.03, "The Asset"
The first two episodes of Marvel's Agents of S.H.I.E.L.D. 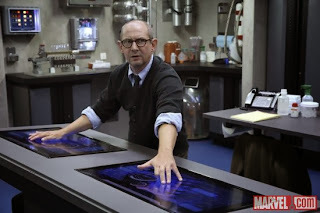 were devoted to establishing a connection to Marvel's cinematic universe and introducing us to Coulson's hand-picked team while they learned to play nicely with one another on the job. Tonight's episode gave us something vastly different: a super-powered villain straight from the pages of Marvel comics. How did Coulson and crew fare against Dr. Franklin Hall? Find out after the jump! Dr. Franklin Hall. When the nerdiest among us saw that name as a part of the third episode, we knew we'd be getting our first look at a Marvel super-villain in Agents of S.H.I.E.L.D. Dr. Hall may not be particulary well-known to the casual fan, but as Graviton he possesses incredible powers and has proven a formidable adversary over the years, even to the Avengers. Episode 3 gave us our first look at Dr. Hall right off that bat as he was being kidnapped by some unknown bad guys, but he didn't seem all to surprised to be kidnapped. After a brief reminder that Skye isn't fit to be out running around on missions, the team gets sent out to investigate Dr. Hall's kidnapping. Before long we get to the heart of the matter: somebody named Ian Quinn, with whom Dr. Hall has a past, has an interest in something Dr. Hall is working on...and has taken him to Malta where, he assumes, he's safe as can be. Quinn, it seems, made a killing on taking Dr. Hall's theoretical idea and making a small, but powerful machine, powered by gravitonium, that disrupts gravitational fields. Quinn, it seems, needs Hall's help to control the much larger and, likely, more dangerous version of the machine. At about this time comic fans should have seen the writing on the wall. While this version isn't identical to the comics, Hall's fate is sealed. The team puts together a plan to rescue Hall and find themselves having to depend on Skye. This works well dramatically as the audience knows that Skye maybe can't be trusted. We are certainly given every reason to doubt her in this episode. Coulson and Ward go along for support and, ultimately, we see the big picture. Hall has a purpose in Malta and he does not want anyone to stop him. He and Coulson have a show down that ultimately alters the course of Hall's life. 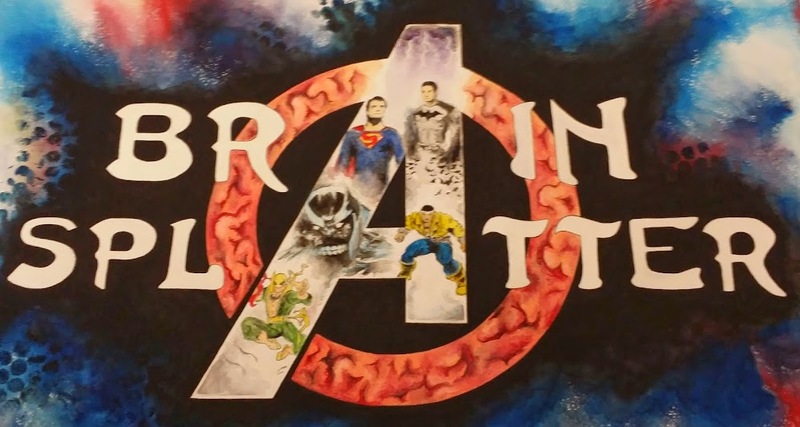 Comic Book Brain Splatter is staying spoiler free in its reviews so I won't detail the last 10 minutes but it doesn't spoil anything to say we haven't seen the last of Dr. Hall. This episode was a little light but still good fun. Skye was the focus and I have no complaints about her pink dress either before or after jumping into the pool. The callbacks to the MCU are noticeably scaled down in this episode and it seems that, from here on out, the show is going to start building up its own expansive universe and that's going to take some time. While this isn't my favorite episode it isn't bad and it sets up the return of Hall as Graviton and that's something about which I'm quite glad. Graviton is too powerful for this green squad to take down; I'm not sure they could take him down at any point without the help of some bigger, super-powered allies and I can only imagine what route this show will take to that end. Perhaps a super-powered hero is going to join the ranks in the near future. Perhaps we'll get an appearance from a core Avenger. Either way this episode established that the writers of Agents of S.H.I.E.L.D. are going to take their time and tell their story. I'd rather have them take time to develop it properly than to rush it and take an errant step. Despite not being the strongest showing so far, "The Asset" gives us some clues to the pacing of the show and certainly puts something extraordinary into play for future episodes.